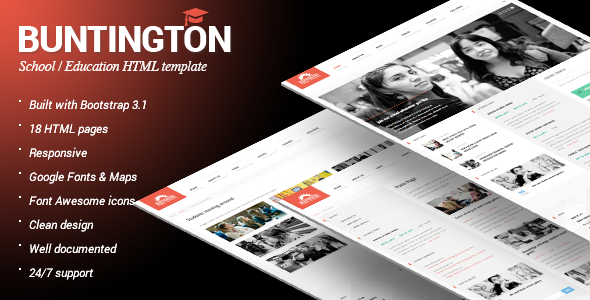 Buntington – School / Education / Academic HTML template. Clean, crisp and simple design that can easily be adapted and used for variety of similar niche websites. Please note that this template does not contain any server-side script (like Flickr, Twitter or send mail). This entry was posted in nonprofit, site-templates and tagged academic, bootstrap, crisp, education, flat, google maps, google webfonts, html theme, jquery, non-profit, responsive, school by Acty. Bookmark the permalink.